Know someone who's passionate about Pizza but follows a Gluten Free diet?! They will love our Gluten Free Pizza Kit Hamper which is packed with brilliant authentic ingredients to help them create the perfect Italian pizza at home! 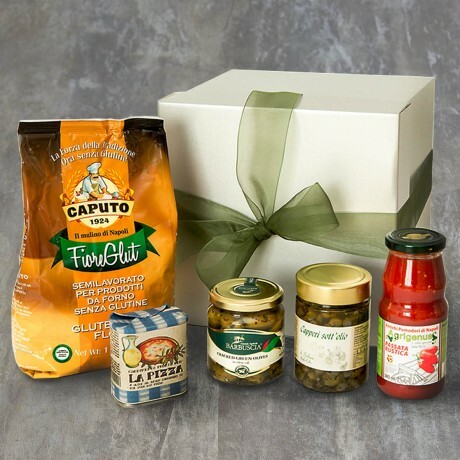 ​Gluten Free Caputo Flour (1kg) The ONLY flour you need to produce perfect pizzas every time and the number one choice of Naples' most famous pizzerias. San Marzano Tomato Passata (380g) This smooth passata sauce is made purely from the very best San Marzano tomatoes. It is sweet and tasty and makes a perfect base for the rest of your pizza toppings. Sicilian Cracked Green Olives (314) These delicious punchy olives go really well with sweet onions and peppers for your veggie pizzas. Capers in Sea Salt (250g) Enjoy the zingy flavour of these crunchy Sicilian Capers on your 'Napoletana' pizza. Pizza oil (175ml) The perfect slightly spicy oil for drizzling on top of any kind of pizza. All our pizza essentials are presented in a strong silver gift box tied with ribbon. A gift message option is available at the checkout. Please note that if we are out of stock of any item we reserve the right to substitute it with the most similar available item. Allergens: capers, may contain milk and sesame.